Homecoming season is officially here. And it’s no secret that Howard Homecoming has been a staple in Black culture — but pop culture as well. The annual event attracts some of the biggest names in music and entertainment each year, in addition to thousands of alumni and guests (Lance Gross, Ashley Blaine Featherson, Laz Alonso, Lala and more). This year will be no different, as the Homecoming theme is Euphoria — perfectly connoting what Howard Homecoming is all about. If you’re planning your first trip to the Mecca, or just don’t quite know what to do, here’s your guide to the 2018 Howard Homecoming weekend. **YardFest: The unofficial kickoff to the weekend starts at YardFest, which gets going around noon. 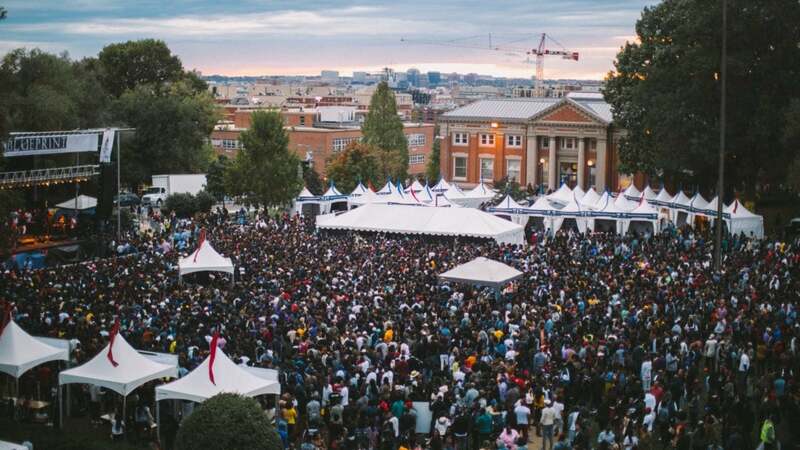 Having changed it’s form over the years, this serves as the centerpiece of Howard University’s Homecoming celebrations, with surprise performances by leading hip-hop and R&B performers. In the past, heavy hitters such as Drake, Big Sean, Rick Ross and more have hit the stage. The yard. 2nd Annual HU Bar Crawl: In its second year, this street takeover will invade both H street NE corridor and the new extended U street NW area. For alumni that have not had a chance to experience Washington D.C the past few years, this is the perfect way to see the “New D.C.” while experiencing some of the local hotspots. Tickets are available here. **The Tailgate: Tailgating has quickly become one of the biggest phenomenons at Howard, and this year is no different. Expect vendors from some of your favorite brands, and HU organizations. A tailgate also wouldn’t be complete without libations, burgers, hotdogs, sausages, jambalaya and perhaps some fellow grads you haven’t seen in years. Howard Center A Parking lot, 2328 Georgia Ave. NW. The Parade: The parade is one of the highlights of Howard’s homecoming. Marching bands, dancers and floats depart from the main administration building at 2400 Sixth Street and proceed to the Valley in the middle of campus. The parade starts at 10am, and prime viewing spots are along Georgia Avenue NW near Banneker High School, where the reviewing stand is located. The Game: The Howard Bison face S.C. State at 1pm. William H. Greene Stadium, 2400 Sixth St. NW. **Halloween Hip Hop Bar Crawl: Hundreds of old school hip hop heads will gather for a day of fun, drinking, partying, and spitting bars from your favorite hip hop classics from the 80s, 90s, and 2000s. Whether you still hit the tailgate, or are looking for an after move, the crawl will conclude with an evening party for all to celebrate. Tickets are available here. HU Hangover Brunch: You’ve been partying all weekend, but it’s time for one last hoorah. Hit the HU Hangover brunch at everyone’s favorite nightclub, The Park at 14th. **Logan Tavern: More than just a place for burgers and craft cocktails, this Logan Circle eatery has won consecutive awards for Best Bloody Mary in DC. On the weekends you can create your own jumbo bloody mary with everything from high end vodkas to hush puppies (yes hush puppies). Their menu has something for everyone with everything from Huevos Motuleños to Caramel Pecan French Toast. The Pig: Offering the “Ultimate Pig Brunch” for $27, including one starter. one entree, dessert -or- Pig Bloody/mimosa, you’ll want to stop here before the tailgate, or on Sunday before you hit up a day party. For a menu that prides itself on face bacon, this brunch choice is a DC go-to. The Bird: Known for its eclectic decor, expansive patio and enclosed terrace, The Bird is located on the corner of 11th and O and their brunch menu focuses on casual southern fare and a variety of breakfast meats spanning from Amish Chicken Sausage to Smoked Duck Sausage. Expect buttermilk biscuits, chicken and waffles and fried green tomato benedict. **Homestead: “Our restaurant is for locals, by locals, so if you’re in town for Howard Homecoming after being away from DC for a while, you’ll be sure experience familiar taste. We’re also just up the street from the university in Petworth so you can go right back to tailgate or whatever other homecoming activities there are on campus,” says General Manager, Megan Segarra. Commissary: Looking for some good food? Potato pancakes, gluten-free pancakes, blueberry pancakes; Commissary does it all along with huevos rancheros, Denver omelets, vegan burritos, and more. Commissary serves breakfast daily with a $55 brunch for two special that includes one bottle of sparkling, two brunch entrees and two coffee/espresso beverages. The upscale diner has something for everyone and won’t break the bank. **Denotes the writer’s top picks.